In the summer of 2002, the Fredericton modeling community was shocked and saddened by the sudden loss of Bob McNutt, a modeler and supporter of the club for many years. The Dr. G Robert (Bob) McNutt Memorial Award has been donated by Bob’s family and will be presented each year to the modeller whose kit is judged best in show. We at CAMS feel that this award is a fitting tribute and are honored to present it. Bob will be sorely missed by all. And we hope that this award will keep the spirit that is Bob McNutt alive for many years to come. 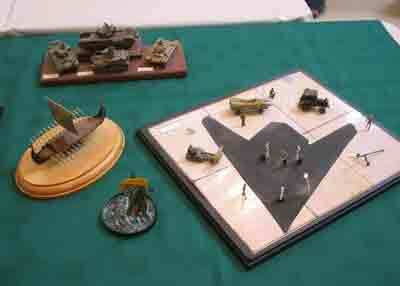 Display of Bob McNutt's work.